Make easily visible paper labels that adhere easily to common surfaces such as paper and glass. Thermal printing requires no ink or toner. Cassettes can be changed rapidly for your convenience while you are working to finish a project. Label maker tape for use with DYMO LetraTag and LetraTag QX50 Label Makers. Print the widest labels you can with label maker. 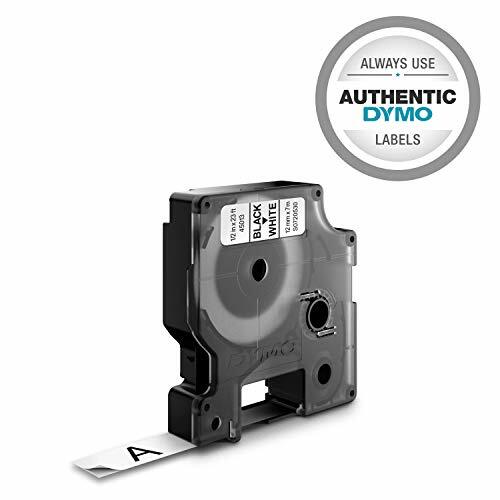 Created specifically for your LabelManager and LabelWriter Duo label makers, these authentic DYMO D1 labels deliver the high-performance you need to handle most labeling jobs. Adheres to nearly all clean, flat surfaces including plastic, metal and glass, and features an easy-peel split backing for fast labeling and makes it easy to get organized. 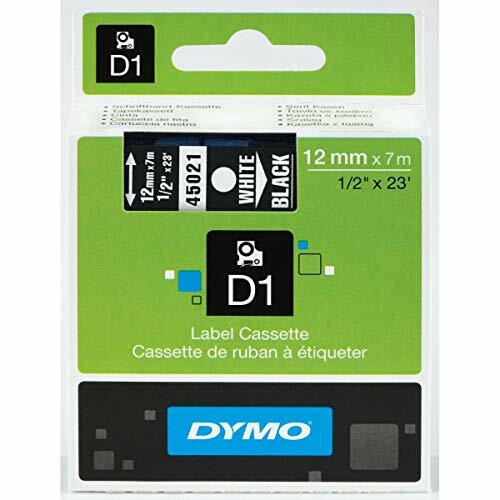 Designed to take the hassle out of home and office organization, your DYMO D1 labeling tape is 1/2-inch (12mm) wide x 23-feet (7m) long with black print on clear tape. Compatible with DYMO LabelManager 120P, 160, 200, 210D, 220P, 260P, 280, 300, 350, 360D, 400, 420P, 450, 500TS, PC, PC II, PnP, Wireless PnP, COLORPOP!, LabelWriter 450 Duo, LabelPoint 100, 150, 200, 250, 300, 350. 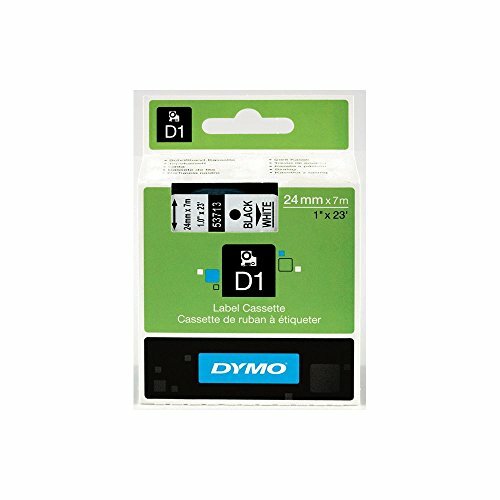 Compatible with a wide variety of DYMO label makers, including the Pocket, 1000+, 2000, 3500, 4500, 5000, and 5500, DYMO's 45010 clear tape supports black-print labeling on a see-through background. Each cartridge offers a full 23 feet of .5-inch tape. Designed for use with DYMO's LetraTag label makers, this metallic silver printing tape provides a stylish way to get organized. Label shelves, storage bins, boxes, supplies, cables, and much more. The 0.5-inch wide tape can be cut to fit your specific needs and adheres easily to nearly any surface. LetraTag label makers utilize direct thermal printing, creating black lettering on the tape's surface. Each package contains one roll of 13-foot tape. 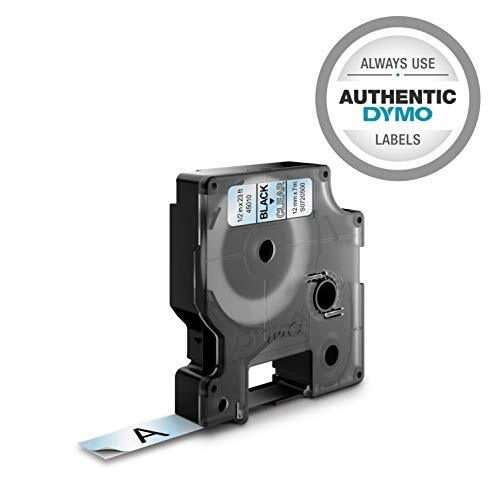 Created specifically for your LabelManager and LabelWriter Duo label makers, these authentic DYMO D1 labels deliver the high-performance you need to handle most labeling jobs. Adheres to nearly all clean, flat surfaces including plastic, metal and glass, and features an easy-peel split backing for fast labeling and makes it easy to get organized. 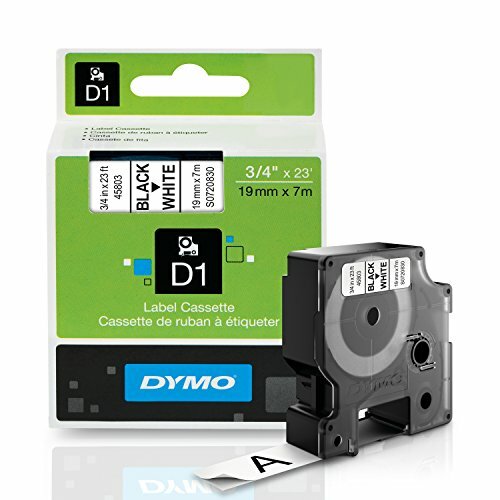 Designed to take the hassle out of home and office organization, your DYMO D1 labeling tape is 1/2-inch (12mm) wide x 23-feet (7m) long with black print on white tape. Compatible with DYMO LabelManager 120P, 160, 200, 210D, 220P, 260P, 280, 300, 350, 360D, 400, 420P, 450, 500TS, PC, PC II, PnP, Wireless PnP, COLORPOP!, LabelWriter 450 Duo, LabelPoint 100, 150, 200, 250, 300, 350. 100% Compatible: Our labels work just as well as the original at a fraction of the price - Jam-free & headache-free! Our labels replace DYMO 30336 Labels as great UPC Barcode , Identification & Multipurpose Labels. Fade Resistant & Reliable: Spartan Industrial Labels uses an NEW, unique material that prints sharp images while not fading under the sun or when covered by tape. Specifications: Compatible 30336 Multipurpose Labels - 1 X 2 Inch Labels. 500 Labels / Roll. 10 Rolls / Case. Compatible Printers: DYMO Label Writer 400 , 400 Turbo , 400 Duo , 450 , 450 Turbo , 450 Twin Turbo , 4XL & More. 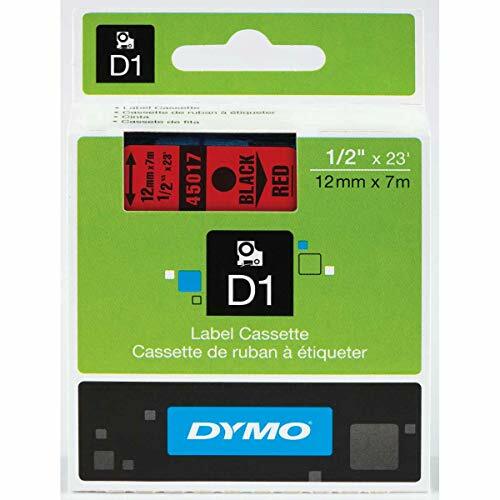 Notice: Spartan Industrial does not sell DYMO - branded labels. " 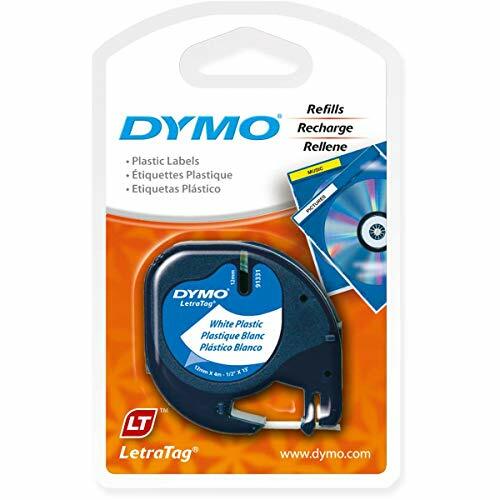 DYMO ", " Label Writer " and all other DYMO - branded product names and SKU trademarks are trademarks of DYMO Corporation. DYMO Corporation does not sponsor or endorse any products made or sold by Spartan Industrial. Specifications: Compatible 30336 Multipurpose Replacement Labels - 1 X 2-1/8 Inch Labels. 500 Labels / Roll. 10 Rolls / Case. Our 1 X 2 1/8 label refills replace DYMO 30336 Labels as return labels , barcode labels , FBA and UPC labels. 100% Compatible: Our compatible replacement small multipurpose labels work just as well as the original - at a fraction of the price! Oftentimes, label makers and other thermal label printer machines experience horrible, time-consuming jams and other issues when using other generic label rolls. Because we only use the highest grade, virgin paper, Spartan Industrial Labels eliminate those headaches and are completely 100% compatible. Compatible Printers: DYMO Label Writer 400 , DYMO 400 Turbo , DYMO 400 Duo , DYMO 450 , DYMO 450 Turbo , DYMO 450 Twin Turbo , DYMO 4XL & More. Notice: Spartan Industrial does not sell DYMO - branded labels. 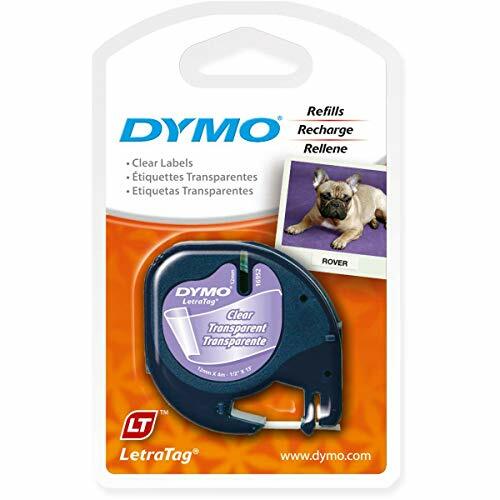 DYMO , Label Writer and all other DYMO - branded product names and SKU trademarks are trademarks of DYMO Corporation. DYMO Corporation does not sponsor or endorse any products made or sold by Spartan Industrial. 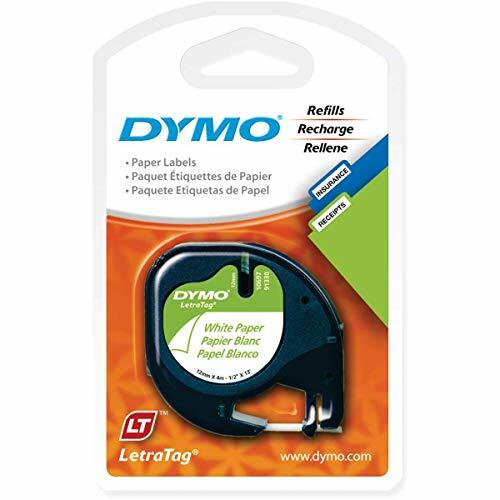 Developed specifically for its popular LetraTag label makers, DYMO's white plastic tape cartridge offers 13 feet of .5-inch printable pearl white plastic tape. For attractive labels that stand the test of time, use a genuine DYMO quality accessory. The Best Black On White Label Tape Is Now Available On Amazon! How would you like to be able to keep everything organized and in order in a very easy, effortless way, putting an end to the chaos? 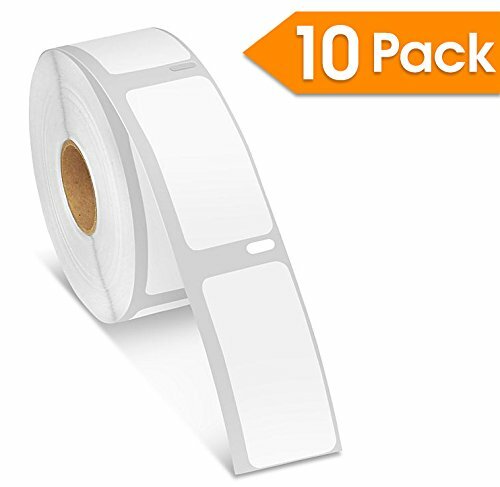 Smyrna Print presents you with the ultimate black on white label tape that can be used in offices, homes, businesses and schools, allowing you to label anything from files to data cables and keep everything neatly stored. An Amazing Cartridge Pack For Unlimited Use Thanks to this top notch offer, you will receive 2 tape cartridges. Each cartridge is 24 feet long, allowing you to print countless labels and serve all your needs. 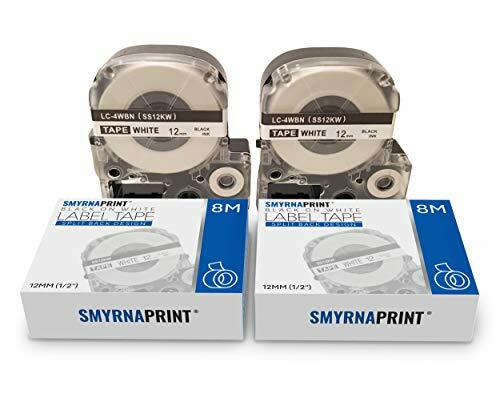 What is more, the Smyrna Print label tape cartridge is compatible with the Epson Labelworks label tape and it can perfectly replace it once it runs out. This top quality black on white label tape cartridge can be used with Labelworks LW-300, LW-400, LW-500, LW-700 and LW-900P label printers. Moreover, it is very simple to use as they feature a split back design for easy peeling and it can be easily removed. Keeping you satisfied is our priority. This is why we offer you a 30 day money back guarantee in case these label tape cartridges do not meet all your demands. Do Not Waste Time And Place Your Order Now While Supplies Still Last! COST EFFECTIVE 2 TAPE CARTRIDGE PACK: Smyrna print makes an amazing offer! You can get 2 label maker tape cartridges at a very low cost. Each tape features a 24 feet length and a 12mm (1/2'') width, which allows you to create many high quality labels and keep everything organized. 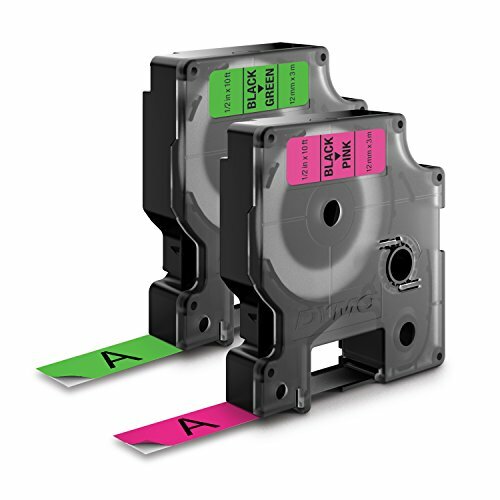 COMPATIBLE WITH MOST LABEL PRINTERS: The Smyrna Print label tape cartridges can be used as Epson Labelworks cassette refills as they are compatible. In addition, they can be used with a wide variety of label printers. VERY EASY TO USE: This top notch label tape features a split back design that allows you to easily peel it. What is more, you can easily remove it without leaving a sticky residue behind. 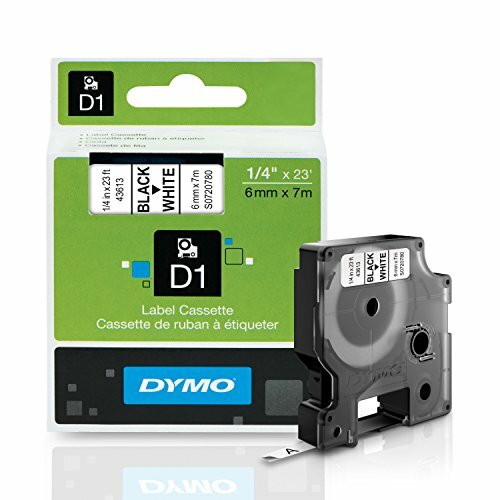 DURABLE, SAFE CASING: The Smyrna Print black on white label tape comes in a hard, durable, plastic casing that allows you to safely and easily store it anywhere you want. 100% RISK FREE PURCHASE: Providing you with the friendliest customer service is our number one goal. This is why we offer you a 30 day money back guarantee in case these label tape cartridges do not live up to your expectations. Designed for use in Label Manager, Label Point, Rhino and Label Writer Duo machines that require D1 tape. Durable polyester coated D1 labels are both scratch and chemical resistant. 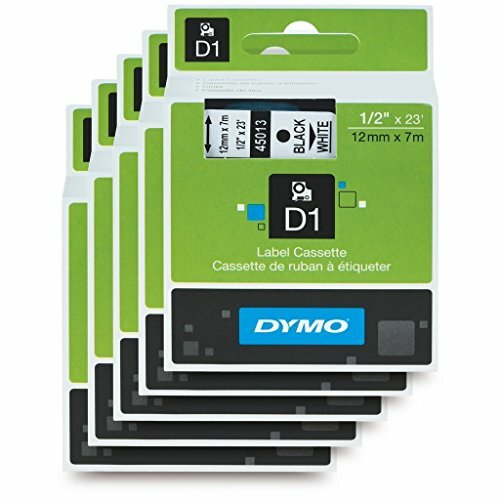 All patented D1 label cartridges feature easy to peel split-back tape. 0 Made in Belgium. Won't leave residue behind when peeled off most surfaces. Tape and adhesive are UV-resistant, so label will neither darken nor fall off over time. Easy-peel, split-back makes separation of label tape backing a snap. Labeling tape is ideal for asset tagging, posting instructions and caution statements. 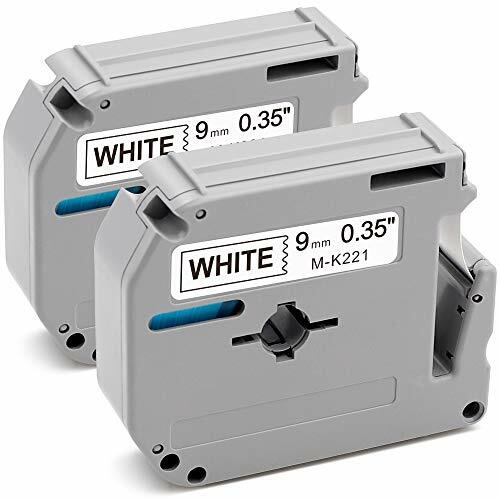 For use with most DYMO label makers, including LMPC II, LM360D, LM350, LP350, LM260P, LM450, LM210D, LM120P, LM220P, LM155, LM150, LP250, and DUO. Made in Belgium. 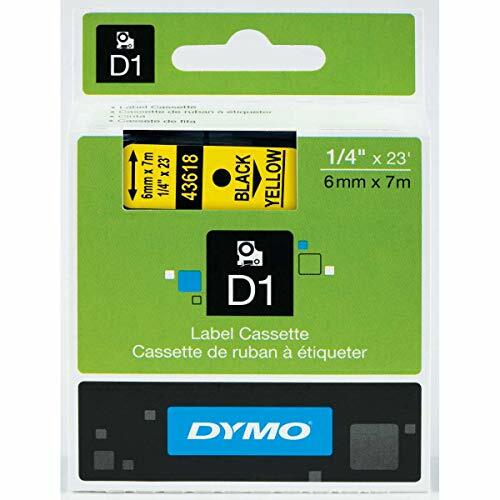 DYMO 45018 yellow tape brings dynamic black-on-yellow printing to your DYMO Pocket, 1000+, 2000, 3500, 4500, 5000, or 5500 label maker. Each cartridge houses one 23-foot by .5-inch tape strip. 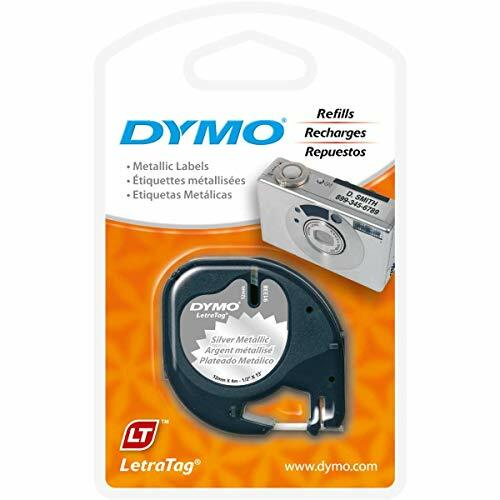 Designed for office Mate II label makers, DYMO embossing labels are built to last. Whether you're using them indoors or outdoors, this embossing tape sticks to nearly all smooth, clean surfaces for clear, easy-to-read labels. Plus, they resist fading and don't leave a sticky residue or break when you remove them. Your embossing labels feature raised white lettering on Blue tape and measure 3/8-inch x 9.8-Feet. This p-touch non-laminated tape comes with standard strength adhesive and is recommended for home and indoor use only. Best suitable for flat dry surfaces. Perfect for kitchen container, school projects, file folders, and other basic labeling needs. At Aonomi, we believe in our products. That is why we back them all with an 12-month warranty and offers 5-star based outstanding customer service. Applications: Available in paper, plastic, metallic, wood, glass and other common surfaces, use to identify items like books, gifts, lunch bags, food containers, file folders, and more. For use with Brother P-touch PT-M95, PT-90, PT-70BM, PT-70, PT-70SR, PT-65, PT-80, PT-85, PT-80SCCP, PT-45M, PT-55BM, PT-55S, PT-65SB, PT-65SCCP, PT-65SL, PT-65VP, PT-70BBVP, PT-70BMH, PT-70HK, PT-70HOL, PT-70HOT, PT-70SP, PT-100, PT-110 (label makers sold separately). P-touch M tapes have a split-back design and is simple to remove, which make them easy to peel and apply to different surfaces. Equivalent to Brother p-touch M-221 tape cartridges; Label Size - text: 3/8 in x 26.2 ft (12mm x 8m). Color(s): Black on White. M221 P-touch Black on White Tape 0.35 (9mm) is a great non-laminated tape for use in the home or office. With standard adhesive that promises to stick to most clean, flat surfaces including plastic, paper, metal, wood and glass. The labeling tape removes without leaving any adhesive residue. 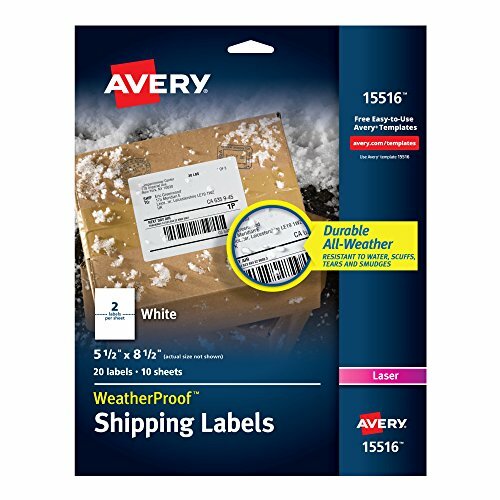 These weatherproof mailing labels with true block technology are made of durable polyester to stand up against harsh weather and conditions. They resist moisture, scuffing, tearing and smudging. The Ultra hold adhesive sticks to tough surfaces ensuring your label won't fall off your package. With true block technology, the labels completely cover everything underneath so you can reuse boxes, mailing tubes, envelopes and more. Compatible with laser printers, the labels are simple to customize with sharp, clear text using free online templates and designs.